Man does not live on porridge alone! Now even more of tasty, healthy and nutritious oil "Majola" in new 10 liters volume. Buy with advantageous! 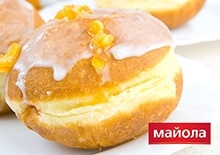 Schoolchildren from Lviv city will take a course on healthy eating under the support of TM "Majola"